The Liberal Democrat mayoral candidate Brian Paddick has put London's "hallmark" black cabs at the centre of his transport policies. In a ten-point plan revealed on Tuesday he pledged to give licensed black cab drivers a seat on the board of Transport for London (TfL). He also wants a consultation on whether rickshaws should be licensed or banned. Mr Paddick is standing against Labour's current mayor Ken Livingstone and Tory candidate Boris Johnson. He said black cabs were "integral" to London's public transport system. "They (cab drivers) have to pass The Knowledge test and their taxis are subject to the most stringent safety checks. "In return they deserve to... have certain privileges not extended to private hire vehicles. "London black cabs are as much of a hallmark of London as the double-decker bus and we need to acknowledge the role they play in making London the most exciting capital in the world." Under his ten-point plan Mr Paddick also wants traffic lights to be re-phased. 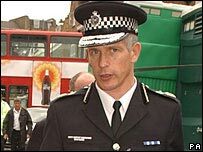 The former Metropolitan Police officer, who left the force in May 2007, will unveil a full transport manifesto later this month. A statement for Ken Livingstone's office said he would run for mayor on his "record of delivering real improvements to London's transport system and building on those improvements". It said he would use "new policies to further improve the transport and ensure that the public transport system is open to all Londoners". Boris Johnson said Mr Paddick's policy of promoting black cabs and giving a seat on the board of TfL to the trade was copied from proposals he launched two weeks ago. He said: "Nothing in these plans is new. "A seat on the board of TfL for black cabs is overdue but is something I have proposed already and a consultation on licensing pedicabs was run by TfL in 2006." A statement from Green Party candidate Sian Berry said: "Brian Paddick's policies are a vague and symbolic overture to the taxi lobby, not concrete measures to actually improve conditions for road users."